I used 'Serialport-server' ( http://shokai.github.com/serial­­port-server/ ). 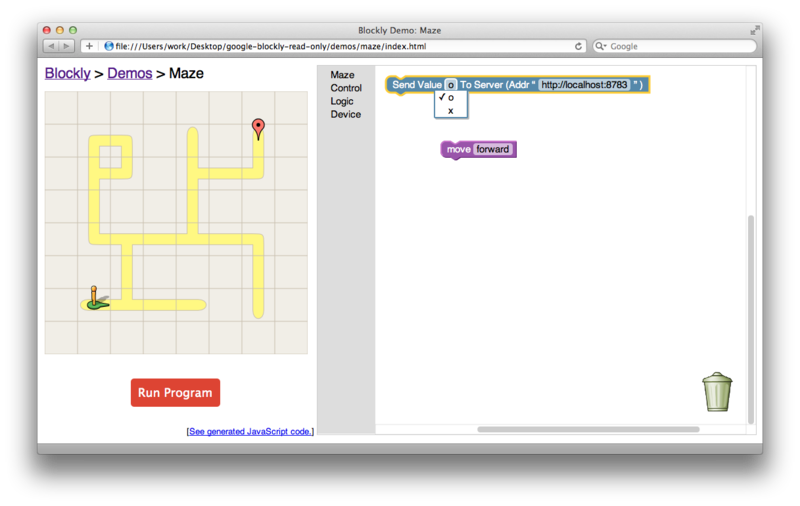 I got the google-blockly code from google code by svn. I added the 'language_device.js' in demos/maze folder. The 'language_device.js' code is in my blog. I added one﻿ line which request the 'language_device.js' to the 'frame.html' in demos/maze folder. I added some lines﻿ to the 'maze.js' in demos/maze folder. The lines code is in my blog. Scratch has the function about 'create a program using blocks'. Scratch has the function about 'serial port communication'. The following page describes the serial port communication between Scratch and Ardino in Japanese and English.